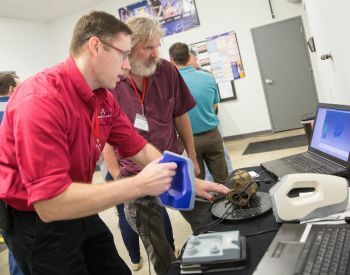 Exact Metrology recently held an open house at its Brookfield, Wisconsin location, showcasing its newest products in 3D printing and CT scanning equipment. One of the most impressive product demonstrations included scanning a single grain of salt with the ProCon CT scanner. The scan picked up details as minute as the ridges in the salt grain, illustrating the scanner's ability to capture the most precise details inside and out. CT scanning is currently used by Exact technicians to examine injection molded parts, castings and forgings, evaluating porosity, grain structure, filament distribution etc. Data can be instantly compared to CAD files in the point cloud for assessment. These high-definition CT imaging devices were, until recently, only available for use in the medical field. They now serve a wide range of product applications, including but not limited to, industrial, manufacturing & construction, power generation/nuclear, medical, and aerospace.